Yeah that was fun!TL:DR? In the end we did good! But lots more details follow. With pictures! 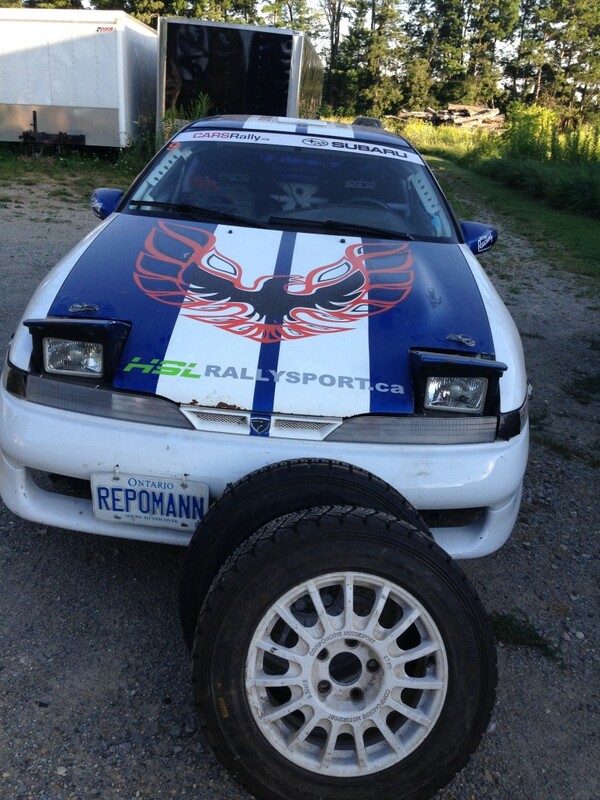 Since it was the first ever Rally Sprint in Ontario we wanted to capture the experience and maybe even convince a few more people to bring out their old rally or new almost-rally cars out. So here’s how it went down for us. 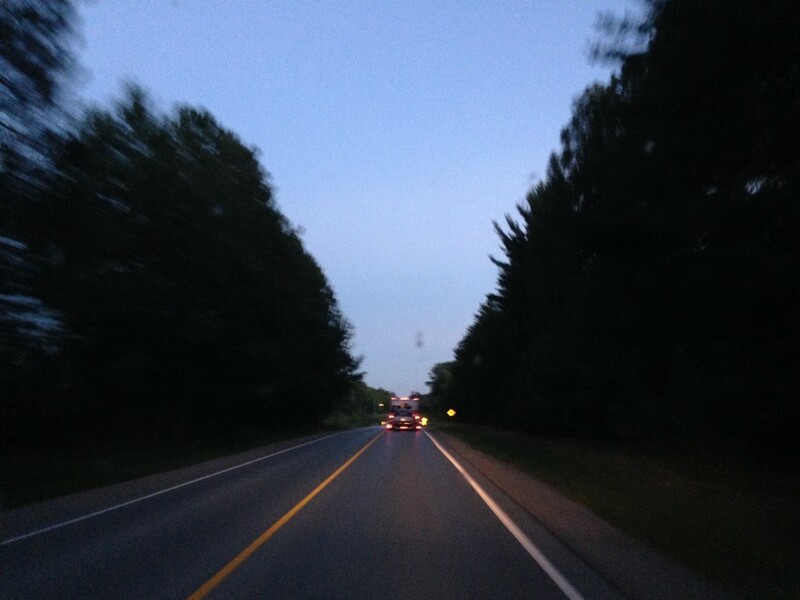 Since the Galway roads are a 2 hour trip from the GTA driving a car – or 2.5 hours in the Jeep – we left early the Saturday morning we were racing. 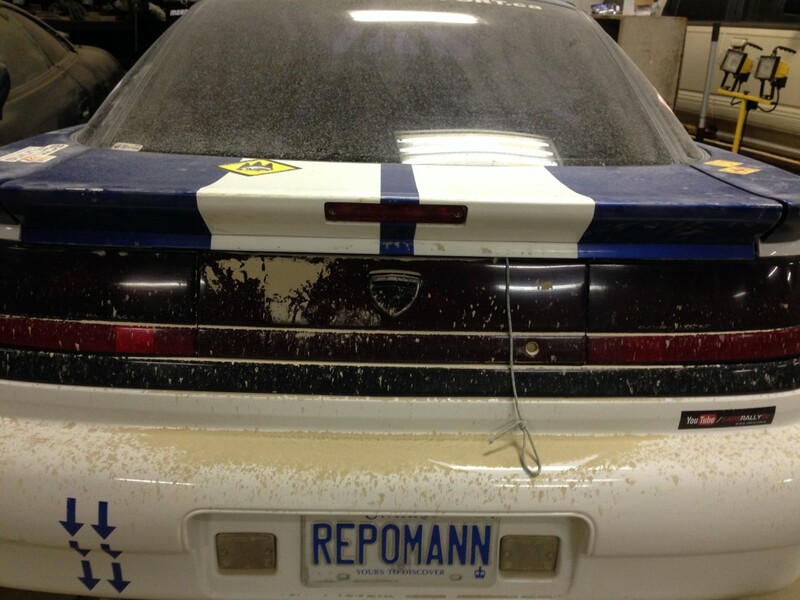 Ryan picked up the car the night before in Alliston, carried it to race HQ, and camped in his vehicle. Rally Sprint Bonus #1: No hotel or restaurant costs for Friday night. 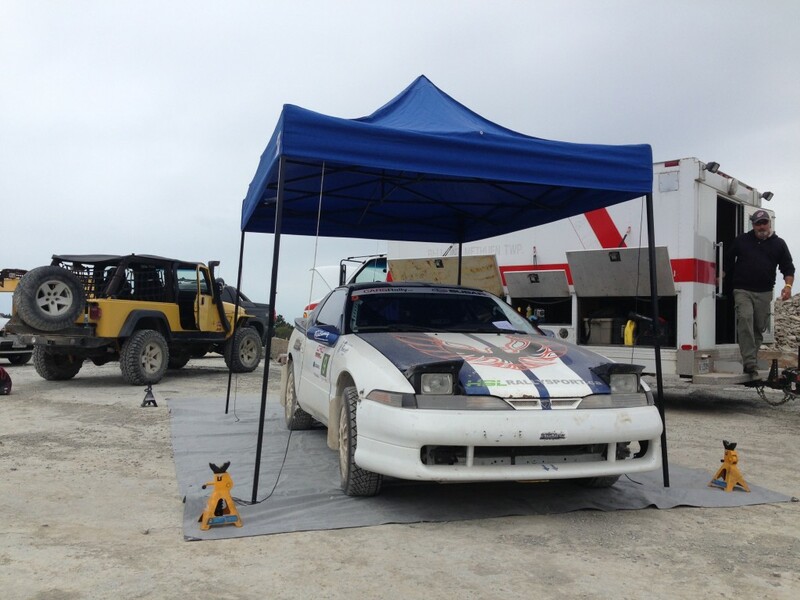 Since the race takes place entirely on closed roads, when we showed up we took the front plate off the rally car, set up the GoPro, and talked to the other competitors until the start times were figured out. Tech was done on the spot and Ryan had sorted out the tires and checked the fluids. Since nothing was leaking we assumed everything was empty, but in fact it turns out we’d fixed all the leaks! At least at idle. Rally Sprint Bonus #2: No insurance costs for the rally car. That’s substantial for us for sure, and probably for everyone. Rally Sprint Bonus #3: Holy relaxed atmosphere! It turns out were first on the road so we got out our best Sebastian Oger excuses about road sweeping and we headed out. 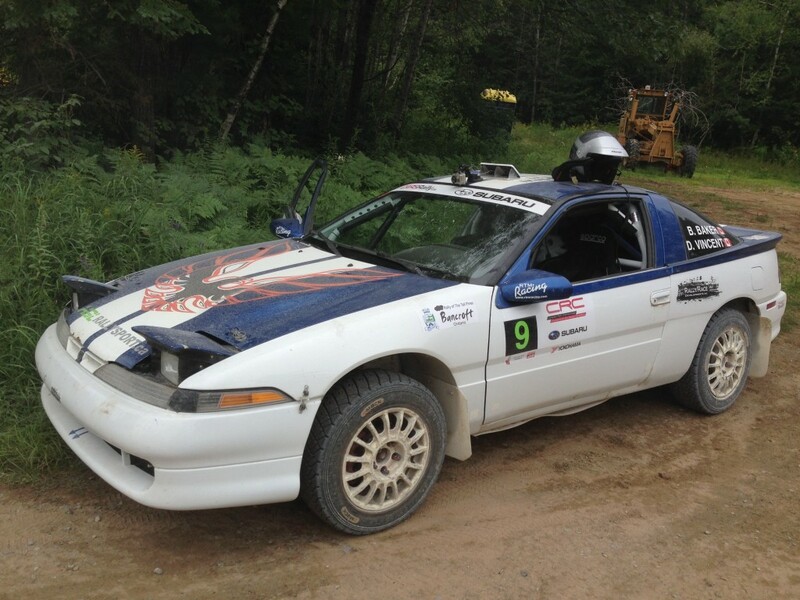 We started in the quarry and ran a ~4 km stage Westbound with a chicane in it, then transited down the road to the next ~4 km stage which ended right near the 507. Then we turned around and did it backwards. We did that 2 times (2 down, 2 up, repeated twice) and that was it for the first Sprint. We were getting faster each time we did each stage and the road got less slippery each pass – maybe that Sebastian dude knows something – so that helped also. The distance was enough to get a rhythm going and the chicane kept the overall speed down plus made it interesting. It wasn’t big enough to handbrake a Talon through and the chicane appeared suddenly – at least until we updated our notes – so we tended to approach sliding sideways on the brakes. Makes for good video and was a great approach setup so that worked out good! Although we did have a bit of a rub through the first time. (That’s from the tractor tires that were sitting in the middle of the chicane; you can see it was half the height of the doors. We’ll see if that will buff right out or not. 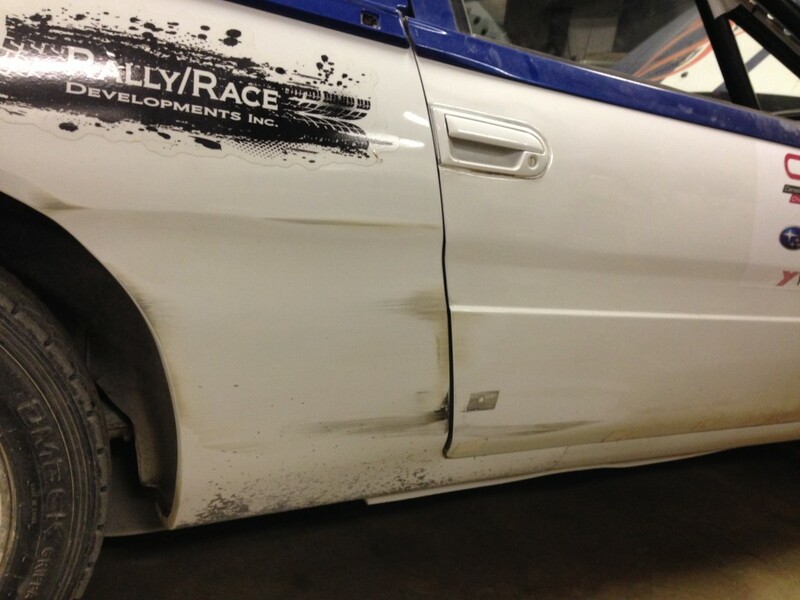 Plus we have gravel damage on the paint at the bottom of the panels so we’ll have to sort that out). We have some video of those runs up if you want to see them. Yet another bonus – they’re short! After we finished the first sprint Ryan BBQ’d some burgers, or at least he started to until he had to take the Jeep to play Sweep and try to pull a Subaru out of a very deep ditch. We finished up the burgers and other people cooked on his BBQ or ate their lunch and everyone hung out or worked on any issues they had. Best part? When the results were in and we won! We have never outright won a rally stage or contest of any kind before so we were pretty stoked to go back out for Event #2. After lunch we headed out for stages B1-B4 and things were feeling really good. We were under 3 minutes for the first stage for the first time, which was cool – that only happened 3 times and two of those including the fastest time were us – and the first pass down/back felt good.You can see two of those runs here. However, as we left for the next pass of the second sprint (B5-B8) we noticed that the ‘volt meter’ (actually the stock boost gauge but which fluctuates based on power/draw, so since we have an actual boost gauge we use it as an indicator – yes we are that professional) was sitting flat. That isn’t usually a good sign, but the car started up right away and drove well so we headed off. Another stage and the fastest run of the day (2:55) and then, when sitting waiting for the next stage to start the temperature gauge started dropping. A lot. That seems pretty unlikely to be real, and then the car died. We’d thought the ‘volt meter’ dying could be a number of things so we had everyone else pull around us and start the stage. A quick test with a jump start from the Jeep – which happened to be there so Ryan could continue to pull out the stuck rally car when we were done – and a voltmeter showed the battery was not getting a charge when the car was running. Yes, the alternator wiring strikes again. So, we left the car on the jumper cables while everyone ran down (B6), came back (B7), and then we got the car lined up and took a fairly leisurely run back up on stage B8 to finish. Yes, despite the car dying on stage we were able to finish and, because the other car in our class of 3 was still in the ditch, we came second in our class. Advantage #5: Take time penalty on stages, still manage to finish due to short stages that are close to HQ. The end of the day came around 4 PM, plaques were given out, and then everyone packed up and headed out. Some people had some pretty interesting towing solutions – the dreaded two wheel dolly, the even more dreaded flat tow (to North Bay! You guys rock), and of course the ‘we’ll drive it there what could happen’ solution. Heck, even Juggernaut brought a flat U-Haul trailer and had a flat, so it seems getting there was at least half the battle. Rally Sprint Bonus #6: We were home before it got dark. And when we got home the car is dusty and won’t start so we pulled the battery and charged it. We’ll tackle re-running the alternator line and make a few more improvements to be ready for Pines, which is the next excitement we have in store. Plus maybe a few other things in there.